Straight Ahead is a classy,jazzy,brash roaring band that has well over 100 years playing experience colectively. From the name of this ensemble it's no wonder that they really bring the crowds to thier feet when they take the stage with thier rousing renditions of classic standards, smooth sounding ballards,up tempo swing,& hard driving licks. 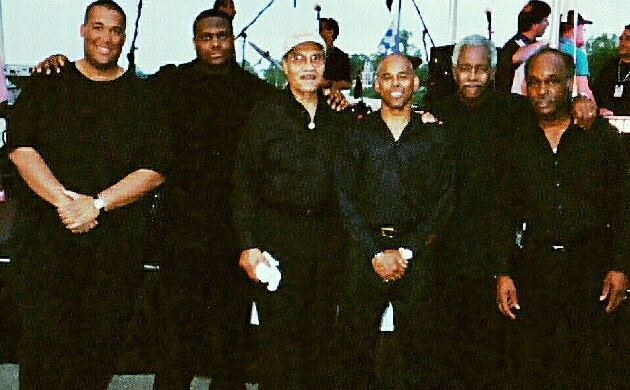 Truly a band to be reckoned with; their name says it all; how they come at ya...."STRAIGHT AHEAD"
GERRY WELLS: TROMBONE, TRUMPET, FLUGLEHORN ; SEAN JONES : TRUMPET ; CONRAD "CONNIE" LESTER: ALTO, TENOR, SOPRANO SAXES ; HAYES JOHNSON : GUITAR ; CHARLES BANKS : HAMMOND B-3 ORGAN ; PONCHO "D" : DRUMS, LDR. Poncho "D" brings a thirty-four year playing background into this venture after launching successful combos such as "Perfect Fit" & "New Found Friend". He says that Straight Ahead gives him the sound and feel like that of the Maynard Ferguson band he played with in the early 80's but it's a younger, brashier type of sound that has been something that he has been on the look out for some time.The members in this group is totally "high energy" and it's geared to take its crowds higher & higher as thier sound drives you to new heights of true enjoyment !!!! Conrad "Connie" Lester: Alto,Soprano, Tenor Saxes -- Has recorded with Jimmy Mc Griff, Jimmy Ponder, Richard "Grove" Holmes and Bill Doggett just to name a few. His resume reads like a "who's who" in the land as either a sideman or bigband leader. He has a flair for the fantastic -- his sound is purely phenomenal to say, the least . Charles Banks: Hammond B-3 Organ, keyboards -- To say that Banks just plays the organ is a great understatement; to say that he wails the organ doesn't even begin scratch the surface. Banks has a style that is recognizable only to those who have heard B-3 greats, Mc Griff, McDuff, Earland, "Groove" Holmes, and the master of the instrument itself, the incomparable Jimmy Smith. Banks has combined the playing styles of these greats and has incorporated it into his style that makes one feel and hear the sounds of those Hammond masters. Hayes Johnson: Guitar -- A personal friend of ledgendary gutiarist and vocalist George Benson, Johnson lends soft blending melodies accompanied with strong, mellow sounding chords that blend completely with the rest of the group. Making his guitar "sing" is how he's been described as of late with riffs that sooth even the most hardend jazz critic who view jazz guitar players under the microscope and listen for that one chord, that one note that sets them apart from the others. Hayes Johnson is one of those that sets himself apart from the class -- a true guitar giant. "Just ask his friend George". Sean Jones: Trumpet -- As a student at Rutgers in his earlier years comparisons were being made of this young man and anotjer trumper great by the name of "Marsalis" and with good reason too. Coming out of New Brunswick, Jones has appeared most recent of note playing with the ledgendary Ray Charles just before getting back in time to play with the group at Red Bank's Jazz & Blues Festival a few nights later. Being versitile allows this musician to play r&b one night and come right back the next and really rip it up with either combo, or big band groups. A real dedicated musician, instructor, and studio man, Sean really puts it all on the table and leaves his audiences "always wanting more". ALL MUSICIANS INVITED TO C'MON OUT AND JAM WITH US !!!! This is made soley from the band personel and throughout the efforts to promote pure enjoyable sounding music for you, our listening audience and it is our goal to keep our listening customers completely satisfied with our performances each and everytime out.